Is this a gift? No subscription is for me. Yes please send gift card. Yes but don't send gift card. New Renew I'm a new subscriber. Please renew my subscription. Start Date Start with current issue. Start with Spring (February). Start with Summer (May). Start with Fall (August). Start with Winter (November). 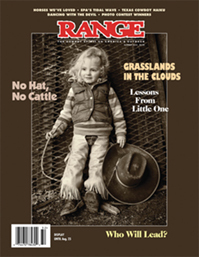 Enjoy award-winning, quarterly RANGE magazine at a great price! New issues are published in February (Spring), May (Summer), August (Fall) and November (Winter). Please allow 6-8 weeks for your first issue to arrive. Includes international postage.